The chesterfield sofa has been in existence since the 18th century, which incidentally was named after the fourth Earl of Chesterfield. Its style is easy to identify, as the arms are the same height as the back, which creates smooth lines. The seating area is deep with buttoned backs. The rolled arms with stud nails are stunning to behold. The chesterfield sofa design is made to last many years and is not a sofa you would throw out after one year. Of course, if you are in the market for a chesterfield sofa, make certain that it is not a cheap imitation, since that defeats the entire purchase of the sofa. The best bet is to purchase a leather chesterfield since these have top grain leather and made to last a lifetime. In fact, you probably will pass it on to your children since a chesterfield sofa gets better with time. These sofas are extremely comfortable and add an instant grace and elegance to any room in your home. Think of this sofa as an investment rather than somewhere to prop your feet on. 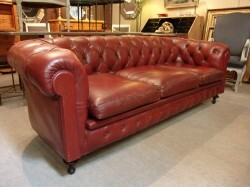 Of course, even with top grain leather covering the sofa, you still will need to take care of the leather. Make sure you have gentle leather cleaner and other protection products to keep the leather looking new. Most manufacturers offer detailed instructions on caring for a leather chesterfield sofa. Unless you choose to purchase the 2 seater sofa version of the chesterfield, you may soon feel the urge to replace the rest of your furniture to accent the sofa. This sofa can be quite large, so you need to make sure you have a room able to accommodate it; then purchase chairs and side tables to highlight the sofa’s leather grains and sofa nails. You may even admire the craftsmanship for many months after you first bring it home. When you look at your new chesterfield sofa in your living room, you will know you have a furniture item that is made to last.